The blind spot in the twentieth-century toolkit of economics and management can be summarised in a single word: consciousness. Today’s real economy is a set of highly interdependent eco-systems, but the consciousness of the players within them is fragmented into a set of ego-systems. Instead of encompassing the whole, the awareness of the players in the larger system is bounded by its smaller subparts. The gap between eco-system reality and ego-system consciousness may well be the most important leadership challenge today – business, in government and in civil society. I was lucky to meet up with Otto when he came to Brazil in 2011, and it is great to see him discussing Natura, the Brazilian cosmetics company which is one of the world’s most sustainable businesses in a case study. 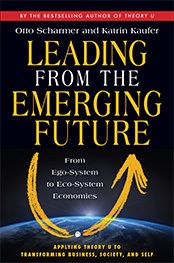 We do have a number of examples now of conscious leadership, but hopefully this new book will inspire many more leaders to explore their own relationship with themselves, their organisations, the environment and society, and through systemic vision, and a comprehension of the whole, move to a more conscious and aware style of leadership and development.